This recipe is from a dusty old cookbook by Didi Emmons given to me by a friend. 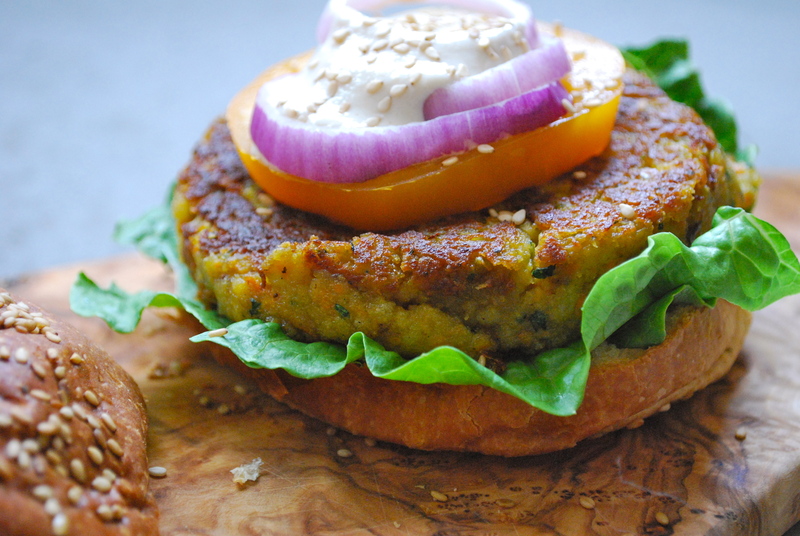 It’s a great veggie burger packed with carrots, cumin, garlic, parsley, tahini, and of course, the tell-tale chickpea. It’s great served with tahini sauce, any toppings of your choosing, on a toasted sesame bun. A little greek salad on the side, and you’ve got yourself a fabulous spring dinner out on the back patio. Don’t make the burgers too big or they will remain too soft in the middle – still delicious but soft. Pack them tight, keep them small, and grill away. They are one of the better veggie burgers around. Heat 1 tbsp of the olive oil in a skillet over medium heat. Add the onions and cook, stirring frequently, until the onions are soft, about 5 minutes. Add the garlic, cumin, and carrot, and cook for another 2 minutes. 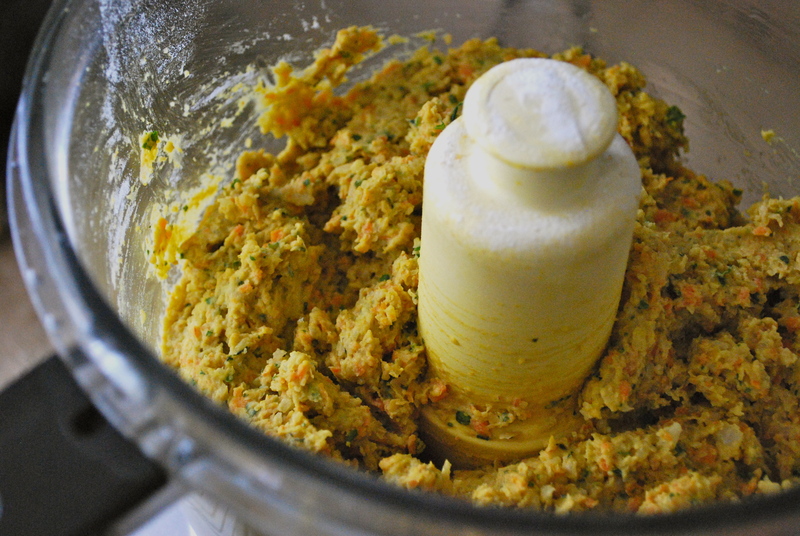 Transfer the mixture to a bowl or food processor. Set the skillet aside. Add the cooked chickpeas and mash together with a potato masher, or chop them in a food processor until they are broken down. Add the tahini and the parsley. In a smaller bowl, combine the flour, baking soda, and salt. Add the flour mixture to the chickpea mixture and mix again, until just combined but not too processed (you still want the mixture to be chunky). Form the chickpea “dough” into patties. Heat the skillet over medium high heat again. Add the other tablespoon of olive oil. Add the patties and cook flipping the patties when needed. Turn down the heat if necessary. Patties should be a deep golden brown on both sides.